Has it been ten years already?! 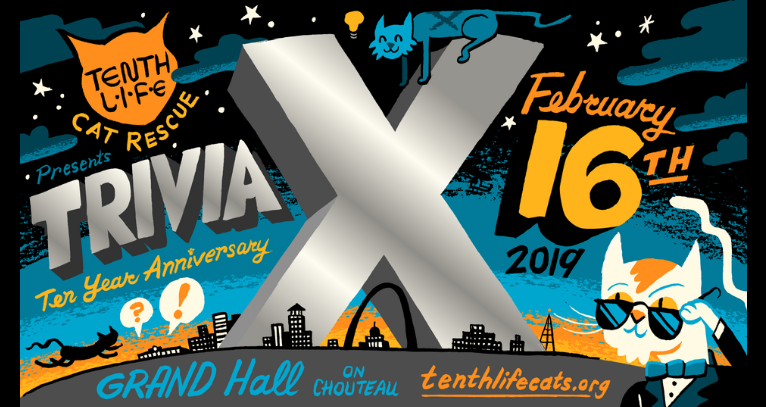 This year, we celebrate Tenth Life Cat Rescue's ten year anniversary with the awesome X theme! What does that mean? You're going to have to sign up to find out. Join us for our Ninth Annual Trivia Night on Saturday, February 16, 2019. Participants will enjoy free beer, wine, soda and water. Guests are welcome to bring their own snacks to enjoy at their tables. Bringing in outside drinks is not allowed. The event will include nine rounds of general trivia. Mulligans will be available for purchase ... don't forget to bring cash! Check out a wide variety of goodies in our silent auction and raffles. If you're extra lucky, you might win a door prize or prize for one of the top three scoring tables. Want another way to win a prize? Participate in our costume contest by grabbing a partner and dressing up as 'celebrity eXes". Show us your best Justin Timberlake & Brittany Spears (in matching denim outfits, perhaps), Brangelina, J.Lo & Marc Anthony or Elvis & Priscilla Presley just to name a few. Use your imagination and surprise us! Doors will open at 6PM, and trivia will begin promptly at 7PM. This event has sold out in previous years, so get your tickets before they are gone! Early Bird pricing ends February 1, 2019, so don't delay. -Tables will accommodate 10 participants just like most other trivia nights! VIP tables (of 10 participants) = $400 Early Bird (before 2/1/19)* includes premium seating, pizza, goodies, swag and a raffle ticket for each attendee. *Pricing on 2/1/19 increases by $50 per table. Want to score a free raffle ticket? Bring any type of kitten food (dry or wet) with you to trivia night to donate to our Kitten Collection. In exchange for your donation, you'll receive one free raffle ticket. (Limit one free ticket per person) We have lots of hungry kittens during the year. Your donation makes sure we have plenty of food ready to feed these hungry babies so they are healthy, adorable, adoptable furry friends. Plus, some of our adoptable cats will make an appearance! The kitties can't wait to see what you've got! Bring your own table snacks. Quench your thirst with free beer, wine, soda, water, or purchase a tasty signature drink. Outside drinks are prohibited. Don't forget to bring cash to pay for mulligans, raffles and games! Silent auction items can be paid for with cash or credit card. We are seeking Table and Round SPONSORS and IN KIND DONATIONS, which are GREAT ways to recognize your BUSINESS or GROUP that is participating. Please email Megan H at trivia@tenthlifecats.org.